Clay has a deep passion for the game of golf, from the history to the beauty, and this passion is evident when teaching his students. The development of the students is extremely important to Clay, whether it’s a number they are trying to shoot or their overall experience playing the game. With over a decade of teaching experience, Clay has learned that in order to keep improving, you must have a clear understanding of your golf swing and the effect it has on the golf ball. 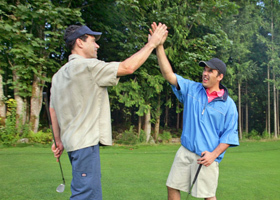 Understanding your golf swing, allows for an increase in confidence and a lifetime of enjoyment.